-- Select a Size/Color -- Blue - Out of Stock! Add some color to any dog’s playtime with these bright and durable rubber dog toys. Enhance your bond with your dog with this colorful twist on an old tradition! Grriggles® Rubber Sticks are great to chew and fun to chase! There's nothing like playing fetch with a good old fashioned stick, right? This improves on the idea with a colorful, bouncy version that is safe and fun. Unlike a natural stick, your pup will be able to see this better and it bounces like it's a branch from a rubber tree (and it sort of is.) It has a nice weight to it which makes it easier to throw for long distances so your dog gets better exercise. When your dog chews this Grriggles stick, the rubber particles will pass harmlessly through their system rather than have the potential to splinter and damage their intestines like a wooden stick might. Still, it's recommended that you supervise your pet so they don't go through it too quickly. After all, the pleasant fragrance and rubbery texture of this toy may be irresistible for some dogs. 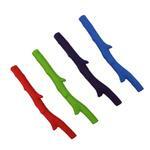 Additionally, as your dog chews the stick, the rubber gently massages teeth and gums for better oral health. Grriggles Rubber Stick Dog Toys Customer Photos - Send us your photo! Catch me if you can, says Riggs. Riggs is running with the new prized griggles stick!! Lucy has been busy with her new stick and wubba! Bruno, being the youngest, has not learned how to share yet. Thankfully, Holly is patient! Way too big and heavy for my dog. I have a Boston Terrier that chews sticks. I thought this would be a good remedy, but he has already destroyed it in a week. What dog doesn't like to haul around a stick? Posted On 03/03/17 by Kim W from , MN Yes, Kim W recommends this product! I ordered the green one and when it arrived, my dog grabbed it right up and headed to her favorite spot to chew on her chew toys. I have to say that I was a bit disappointed to see tiny teeth marks so soon. My dog on the other hand loves it. Time will tell if it will be durable enough for my young dog and her enjoyment of chewing. Posted On 02/01/17 by Jeanene S from Pampa, TX Yes, Jeanene S recommends this product! My 6 lb terrier mix loves to pick up and play with sticks outside. I thought these would be perfect for her, and they would be if they were smaller. These are designed for much larger dogs, but I can't complain just because I didn't read the description well enough. Will have to find a bigger dog to give them to. Postage would cost as much as the item to return. I hope I can find the exact same thing, only much smaller. These came in the mail today. My dogs obliterated them in less than 20 minutes. Sad. It's a fun stick for dogs to play with but not for dogs that like to chew a lot. Too large for small dog. Posted On 12/21/16 by Tammy C from Raleigh, NC Yes, Tammy C recommends this product! I did not realize how thick and heavy this toy would be. It is too big for my 10 lb puppy. Would recommend for a larger dog that can carry it. Posted On 12/09/16 by Linda T from , Yes, Linda T recommends this product! Thought this would last a long time, but my dog just kept ripping off pieces of it. Disappointed. Posted On 12/07/16 by Emily G from Raleigh, NC Yes, Emily G recommends this product! i got this in purple for my dog who loves sticks outside; and she will not let anyone get it from her! Seems pretty durable too. I got this for my elkhound who ruins any toys that are laying around. This is super tough so I am hopeful it will last a while. Dog loved it ...Owner not so much. Posted On 10/31/16 by Marilyn D from , OH Yes, Marilyn D recommends this product! My dog loved chewing on the stick and fetching it. I didn't like the fact that it fell apart when he chewed on it. Not paying attention to measurements the stick was way to long and heavy for my 12 lb. maltipoo. So we cut it in half and now he has two and size is perfect.! Posted On 10/18/16 by Raquel C from New York, NY Yes, Raquel C recommends this product! My friends dog loves this stick. I got for him as a gift n he loves to fetch it and when he's done running around he loves biting it. Posted On 08/24/16 by Christie C from Santa Rosa Beach, FL Yes, Christie C recommends this product! The product quality is wonderful. It's just really heavy, which causes a problem for my smaller dog. But it's a great stay-in-place chew toy. Maybe not so great for fetching if you've got a small dog. Posted On 08/14/16 by Alex from Seattle, WA Yes, Alex recommends this product! Great product! my dogs loves them. They keep them busy for hours. Posted On 07/31/16 by Pat from Saugerties, NY Yes, Pat recommends this product! My dog loves the stick! Posted On 04/24/16 by Tena W from Riverside, CA Yes, Tena W recommends this product! My little dog, Yogidog, who is part mutt and part lab, really went nuts over this toy! Posted On 03/06/16 by Alex from Seattle, WA Yes, Alex recommends this product! Purchased these as Secret Santa gifts for pups in rescue. They were a big hit! Posted On 02/27/16 by Rochelle G from Brewster, MA Yes, Rochelle G recommends this product! My only hesitation to 5 star this is because it's too heavy. I didn't realize the longer Grriggles weighed so much. I would recommend it for a larger dog. Posted On 02/04/16 by J. from St. Jospeh, MO Yes, J. recommends this product! This rubbery toy is perfect. My dog who doesn't usually chew on things love this toy and it keeps him busy. Posted On 12/07/15 by Phyllis W from Philadelphia, PA Yes, Phyllis W recommends this product! Perfect toy for my sisters dog. She is a 56lb dog and loves chasing it. Posted On 11/28/15 by AU from Newark, NJ Yes, AU recommends this product! This is a great chew toy but I thought it was going to be not so thick and it is not useful for Zora my Yorkie who isn't much bigger than this toy. Fortunately my Rocky who is a bigger dog has been enjoying it. Posted On 08/06/15 by Kelly T from St. Catharines , Canada, Yes, Kelly T recommends this product! I bought the griggles stick not knowing what to expect! It's actually pretty heavy and well made ... I don't recommend throwing it inside to play with because it could do damage! But for outside its fine! She's teething and loves to chew on it and the rubber hasn't flaked off! Posted On 07/24/15 by Brittany from , Yes, Brittany recommends this product! It's a little heavier than I expected, but other than that, it's great. Posted On 07/23/15 by Brittany from , Yes, Brittany recommends this product! It's a little heavier than I expected it to be. Other than that, it's exactly what I thought. Posted On 06/11/15 by Horseshowmom from Rural, NC Yes, Horseshowmom recommends this product! I bought one of these for my hard-chewing little roughneck rat terrier. It worked so well that I ordered two more for my daughter's Labs, who like to bring sticks inside but aren't supposed to. These are really sturdy toys. Posted On 06/03/15 by DogMa from PDX, OR Yes, DogMa recommends this product! My rescue GSD loved this and was not able to destroy it. That being said, I do not leave my dogs unsupervised with chew toys, so given enough time, it might have been devoured. Posted On 05/28/15 by June K from Mount Prospect, IL Yes, June K recommends this product! Nice, heavy rubber. I hope it keeps my pup busy. Posted On 02/19/15 by Sarah B from Buffalo, NY Yes, Sarah B recommends this product! I found this item in an attempt to replace a rubber tree I had purchased last year for our pit. He loves that stick but unfortunately the growing pup got a little hungry and chewed it - I found these - really high qualify, a good heavy toy for a powerful dog and half the price of what I paid earlier. Awesome! Posted On 02/18/15 by Julie from , RI Yes, Julie recommends this product! My 80lb shepherd lab super-chewer absolutely loves this toy, but we have to keep it as a special occasion toy-- otherwise he chews pieces off very quick. The solid rubber is relatively durable for all types of adventures (water/woods/snow), and it has a good length and weight for my big guy. Just wish he couldn't chew through it cause he loves it so much. Searches around the house for it even; we have to hide it! Posted On 01/04/15 by Nicole from , TX Yes, Nicole recommends this product! This item is very well made but it's a bit heavier than I expected. My Golden Retriever is a smaller female and it's too heavy for her to carry around. She loves to chew on it though so it's great for that if nothing else! But I'd recommend this for bigger dogs if using to play fetch. love the stick chew toy. she will fetch and chew for hours. great for new puppies. Can't wait for warmer weather when we can enjoy this toy outside. Posted On 12/02/14 by Christine L from Lisle, IL Yes, Christine L recommends this product! Really well made toy!! This one will last! Love it..
Posted On 11/10/14 by jameese v from , NY Yes, jameese v recommends this product! we gave it to our border collie/lab mix puppy (6 mo old) and he started chewing it apart so we took it away from him.. we will use more a fetch toy with supervision. These are great for playing catch! Unfortunately, my french bulldog is also a chewer, we left it on the floor and he had it in pieces within 15 minutes. I am giving this a 3 star review, if you dog does not have the need to chew, this is a GREAT catch and retrieve item. Posted On 12/07/13 by Jennifer R from Nashua, MT Yes, Jennifer R recommends this product! These toys are very durable and much safer than actual sticks. I got these for my two dogs, one is teething and the other just likes to chew. These are exactly what I expected them to be. My dogs absolutely love them! Posted On 11/11/13 by Sabrina T from Sewell, NJ Yes, Sabrina T recommends this product! My boy is a big chewer that loves to pick up sticks, run around with them, and chew on them. It gave me a heart attack every time he used to pick up sticks because he could hurt himself on them. So I bought a couple of these for him. They have been here for 4 months and they are still in very good shape. He hasn't been able to chew through them and they are much safer for him to fetch and run around with than an actual stick. This is a great toy for chewers and dogs who like to fetch! I thought this stick looked awesome online, but it was too big and heavy for my pug. She'll chew on it from time to time but only if I hold it. I recommend this product but for larger dogs only. Posted On 11/08/13 by Veronica W from Asheville, NC Yes, Veronica W recommends this product! My boy loves playing fetch with this! Posted On 11/07/13 by coleen o from , MI Yes, coleen o recommends this product!